I'm a bad amateur jazz saxophonist and an even worse pianist, but was trying to plunk out the chords in the left hand and melody in the right. I couldn't find any voicing/voice leading that sounded like a natural default and would include the -9. 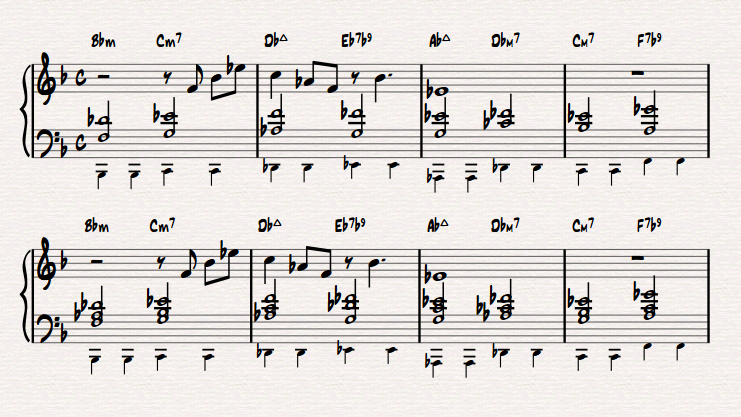 If there are any jazzers out there who are fluent in piano, what would be your natural default voicing when comping here? Would you just take the -9 as info for the soloist that they should play a diminished scale here, mixing in the sound of the parallel minor? Or would you play the -9 as an audible signal to the soloist that that's what's going on? Would you likely play a voicing with an A natural or something in it, rather than the 5? If you were playing solo, would you want to lay out the 4-5-1 bass line, and therefore probably not voice the -9? How about this? If you have to cover the bass as well, fit in as much as you can with the RH. Two versions. A skeleton voicing and a fuller one. Not the answer you're looking for? Browse other questions tagged piano jazz chord-voicings or ask your own question. Dynamic techniques for left hand? Is this voicing for Dmin7 right?